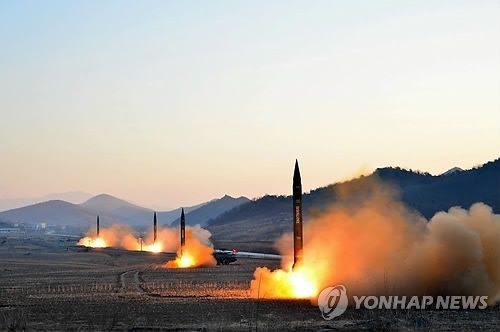 SEOUL, June 13 (Yonhap) -- The United States will leave "all options" on the table in responding to a threatened intercontinental ballistic missile (ICBM) test by North Korea, a State Department spokesperson was quoted Tuesday as saying. Katina Adams made the remark after North Korea warned Saturday that it is "not too far away" from test-firing an ICBM capable of striking the U.S. mainland. "As we have said before, all options for responding to future provocations must remain on the table," she told Washington-based Voice of America. "We call on (North Korea) to refrain from provocative, destabilizing actions and rhetoric, and to make the strategic choice to fulfill its international obligations and commitments and return to serious talks." North Korea claimed in an editorial in its official Rodong Sinmun newspaper that a series of recent strategic weapons tests has brought it closer to testing an ICBM. Last week the communist nation test-fired what appeared to be a round of short-range anti-ship cruise missiles in its fifth missile launch since the liberal Moon Jae-in administration took office in South Korea on May 10. "The great success of test-firing an intercontinental ballistic missile, which we are sure to achieve, will mark a historic watershed moment in the failure of the U.S. hostile policy against us," the editorial said. "Historically speaking, the U.S. has never dared to go to war with a country that possesses nuclear weapons or ICBMs."